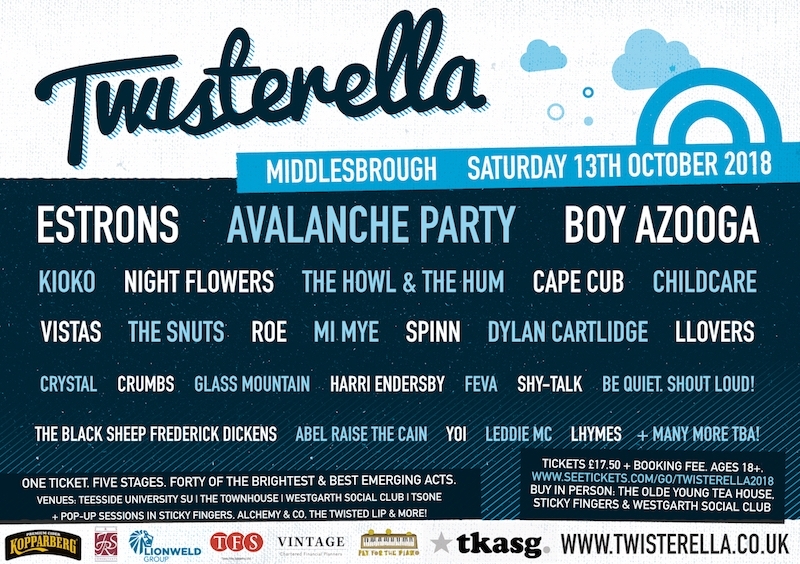 The fifth annual Twisterella Festival in Middlesbrough has started to get the buzz going for the Saturday 13th October event by announcing the first wave of bands taking part. With a mammoth line-up of emerging talent, local rockers Avalanche Party are joined by the likes of alt noise makers Estrons and the indie sounds of Boy Azooga to lead a selection of really bright talent. Taking place at venues across Middlesbrough this festival catches the end of festival season perfectly and is set to boast even more awesome artists with more announcements to come. Also on show will be Night Flowers, The Howl & The Hum, Cape Cub, Childcare, Vistas, The Snuts, ROE, Mi Mye, Spinn, Dylan Cartlidge, Llovers, CRYSTAL, Crumbs, Glass Mountain, Harri Endersby, Feva, Shy-Talk, Be Quiet. Shout Loud!, The Black Sheep Frederick Dickens, Abel Raise The Cain, YOI, Leddie MC and Lhyme. Tickets for this year’s Twisterella Festival on Saturday 13th October are on-sale now.